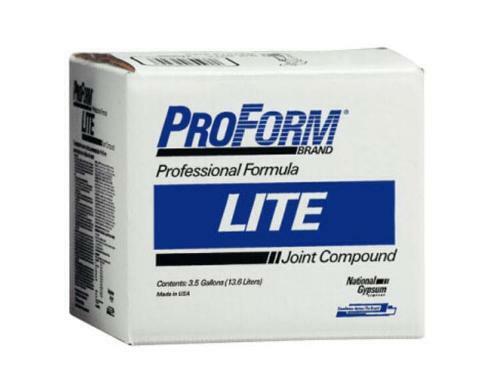 National Gypsum ProForm BRAND Lite Joint Compound - 3.5 Gallon Box at Tamarack Materials, Inc.
ProForm® BRAND Lite Joint Compound is a vinyl base ready mix lightweight joint compound. Approximately 30% lighter than conventional ready mix, Lite Joint Compound pulls and sands easier and reduces shrinkage by up to 33%. Lite Joint Compound is designed for use in finishing gypsum board joints, spotting fasteners and finishing cornerbead.